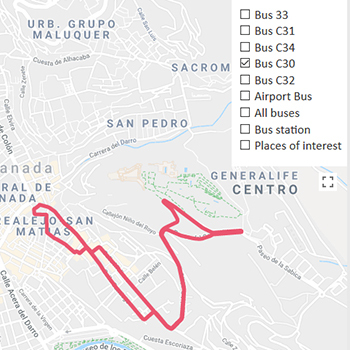 Buses in Granada - prices, stops, connections, etc. On 16th July 2018, major changes were made to many bus routes in Granada and the 4 bus replaced the LAC bus. The 33 bus goes directly from the bus station to the Cathedral on the Gran Vía: it is not necessary to change buses. You can buy CREDIBUS CARD or BONOBUS from tobacconists and newspaper kiosks. You can also buy them from the drivers of any bus EXCEPT the LAC. The CREDIBUS CARD or BONOBUS costs 5€, 10€ or 20€ plus a refundable fee of 2€. Subsequent top-ups are available for 5€, 10€ or 20€ from the ticket vending machines at the bus stops (see photo on the right). You can pay in cash (coins and notes) or with a credit card. For top-ups of 5€, 10€ o 20€, the journey costs 0.87€, 0.85€, 0.83€, respectively. 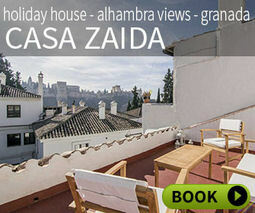 The CREDIBUS CARD is a good idea if you are going to use public transport several times during your time in Granada. Several people can use the same CREDIBUS CARD: just swipe the card over the ticket validating machine reader once per person. You can change the language of the ticket vending machines and these provide information about bus times and routes. You can also use them to check the balance on your CREDIBUS CARD. You must validate the CREDIBUS CARD or BONO BUS at one of the ticket validating machines before getting on the bus (see below). Single bus tickets must be bought before you get on the bus from the ticket vending machines at the bus stops (see photo on the right). You can pay in cash (coins and notes) or with a credit card. A single ticket costs 1.40€. Children under 6 travel for free. 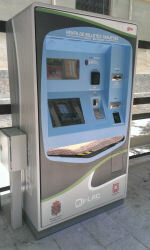 You must also validate your ticket at one of ticket validating machines before getting on the bus (see below). It is necessary to validate your ticket or credibus card for each journey BEFORE you get on the bus. You can validate your tickets at the ticket vending machines at the bus stops (see photo on the left) or at the ticket validating machines (see above photo). You can change buses for free for 60 minutes either with a single ticket or the credibus card or bonobus. There are two a circular night buses (111 or 121) which go along the Gran Vía and through the centre of Granada between 00:00 and 6:00.